Hello all! Back again for another edition of Wanderlust and Wordy Wednesday. I had every intention of posting sooner, but things have been…complicated. I will most more later. For now, I stick with this weekly edition to keep me coming back and to keep me sane. Welcome! Quotes first, today I think. “That’s the problem with being the strong one. No one offers you a hand.” – m.t. On to the wanderlust. I have been asked by my dear neighbor, Sarah C, to cover a town this week that is not only near to my home (nearer than any I’ve covered so far) and near to my heart. Rome, GA. I’m here pretty much every weekend so prepare for a LOT of information. Rome is on the border with Alabama, in Floyd County. It’s the largest city in northwest Georgia and 19th in the state. It’s built where the Etowah and Oostanala rivers meet to form the Coosa River. It was once occupied by the Creek Indians and later by the Cherokee. The city sits on seven hills, with the rivers flowing through them, inspiring the early European settlers to name it after the city in Italy. It was popular in the antebellum age due to it’s strategic location on the river. It is the second largest city (behind Gadsden, AL) in the interstate triangle between Birmingham, AL, Chattanooga, TN, and Atlanta, GA. It’s known for it’s medical care (Redmond Regional Hospital and Floyd Medical Center) and education (several colleges). In the 1920’s, the U.S. partnered with an Italian company to build a rayon plant here. The project (and Rome, GA) were honored by Benito Mussolini in 1929 with a replica of the statue of Romulus and Remus nursing from a mother wolf. It still sits in historic downtown. Rome is home to many beautiful things. We will start with one of the most well known. There are four colleges in Rome: Georgia Northwestern Technical College, Georgia Highlands College, Shorter University, and Berry College. Berry is far and away the most popular and I’ll focus on it mostly. 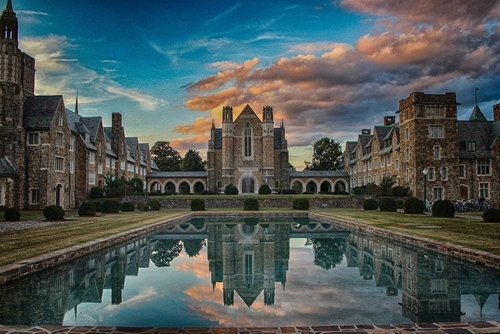 Berry College was built in 1902 by Martha Berry. With a campus of over 27,000 acres, Berry claims to have the largest campus in the world and is often ranked on the lists of most beautiful campuses. There are numerous hiking, biking, horseback riding, and other things available to the public on campus (more than 80 miles andtwo disc golf courses). The Georgia Department of Natural Resources oversees about 16,000 acres. The property may look familiar to you because it has been used in Remember the Titans, Sweet Home Alabama, and Disney’s Perfect Harmony. Be sure to visit the House ‘o Dreams and the Old Mill. They are not to be missed. 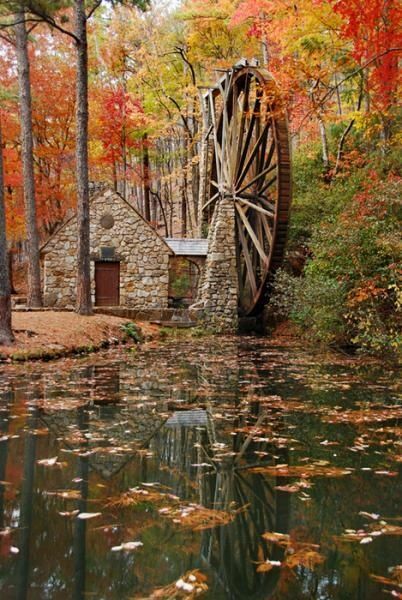 The Old Mill is a photo op for many. There are four churches on campus. Berry was founded on christian principles and works with Chic-fil-a to run one of the WinShape Foundation Camps. Possum Trot is a really neat church on campus and was built originally around 1850. This is where Martha Berry got her start by desiring to teach those in her community to use their talents and resources better. Frost Memorial Chapel is one of the most beautiful buildings (in my opinion) on the campus, whether you are religious or not. It stands atop one of the hills on campus and was built by students and staff in the mid 1930s. The other two chapels are Barnwell Chapel and the College Chapel. Rome has a great historic downtown. There’s tons of places to eat, from standard like the Mellow Mushroom and Jefferson’s (perhaps a local staple?) to the The Partridge, Curlee’s Fish House & Oyster Bar, and the Honeymoon Bakery. I recommend any of them. For a small (ish?) north Georgia town, Rome has a decent nightlife. There’s always a crowds at the Mellow (mushroom), 400 Block Bar (a cozy little bar above the upscale Italian restaurant, La Scala), Moon Roof Bar (behind/above the Harvest Moon Cafe), Dark Side Of The Moon (Beside the Harvest moon), and of course, the Brewhouse Bar & Grill. Food and drink are in no shortage on downtown Broad Street. There’s also many places to get your outdoor fill. There are two cycle shops, Ordinary Bicycles and Cycle Therapy are both located on Broad Street. There are many great roads in and around Rome for bicyclists to travel on. Blue Sky Outfitter is another great place to get your outdoor gear fix. Perhaps one of my favorite sports related places on Broad Street is the River Dog Paddle Co.. Mike (the “Chief Paddle Officer”) and Connie (the owner) are awesome people. I met both of them in the shop this summer, along with “River”, the dog behind the name and logo. Now, allow me to say that my knowledge of paddle boarding was very limited. Connie and Mike both were more than happy to answer my questions and spent over an hour (in between customers, of course) to welcome me and my boyfriend to the world of paddle boarding. They do courses and rentals! Rome is a vibrant city, if you couldn’t tell. It’s always alive with some event, whether it’s something at the forum, a play at the Historic DeSoto theater, or a block party. There are also many parks and forests here (not including Berry’s campus). For a full list of parks, visit here. I’m going to touch on a few of my favorites. The Rocky Mountain Project is a great fishing hole. There are also primitive camping sites, picnic shelters, and hiking trails. James H. Floyd State Park (known nearby as Sloppy Floyd) is technically up the road in Summerville, GA. But it’s worth it to visit if you’re going that way. It’s part of the Chattahoochee National Forest, has over three miles of trails, and two stocked ponds. A trail head of the Pinhoti Trail is only 1.6 miles away. There are a few cottages and you can also rent paddle boats. There’s a great playground for kids. Be sure to check out the Marble Mine Trail while you’re here. I haven’t conquered this one yet because I just learned about it this past summer. It’s an “easy” 1.7 mile trail to a seasonal waterfall and the start of an abandoned marble mine. Well, dear neighbors and readers, I hope you’ve learned some things you didn’t know and perhaps I’ve sparked your sense of wanderlust. Rome may not be an ideal destination when you think of a place to go, but if you really dig into the heart of the city, there is something here for everyone. If you ever find yourself over that way or just passing though, take a chance and stop! If you have any questions or comments, please feel free to share them!